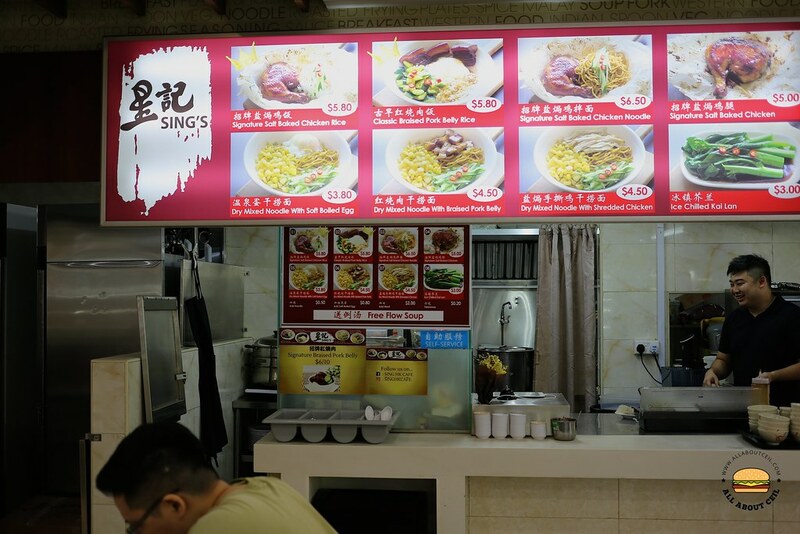 This hawker stall used to be known as Sing HK Cafe when they first started at Everton Park. They were there for about a year or so before closing down. They have made a comeback in this coffee shop at Jurong East for slightly more than a month. Alfred Mo, the owner, was there when I visited on a Sunday for lunch. He said, "Our signature is the Hong Kong style Salt Baked Chicken." The dishes are prepared and cooked by him daily. I could not quite tell that Alfred is originated from Hong Kong as he did not speak with a Hong Kong accent when I talked with him in Mandarin. He has been living in Singapore for more than 15 years. He used to be working in the private banking sector after obtained his Master's degree. He always has the passion for cooking and that prompted him to open Sing HK Cafe about 2 years ago as he has wanted to serve Hong Kong style comfort food in Singapore. I decided to go with the Signature Salt Baked Chicken Noodle ($6.50) and Classic Braised Pork Belly Rice ($5.80). 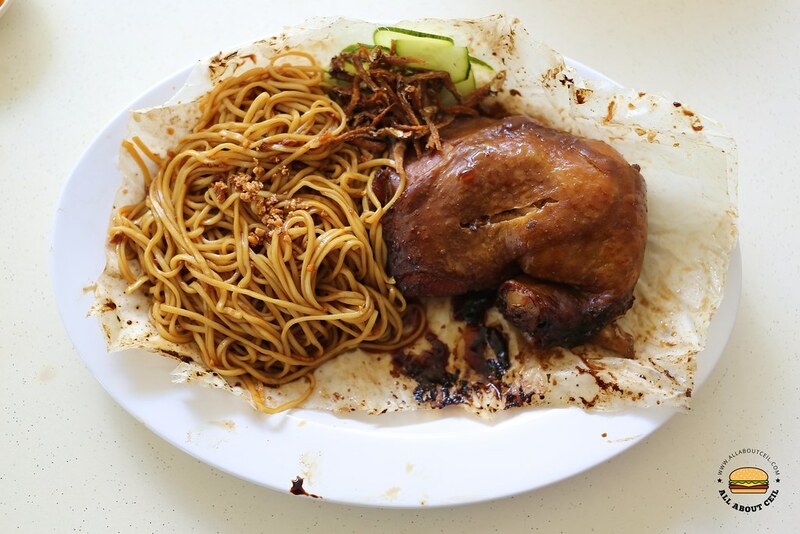 There are also Signature Salt Baked Chicken Rice ($5.80), Dry Mixed Noodle with Soft Boiled Egg ($3.80), Dry Mixed Noodle with Braised Pork Belly ($4.50), Dry Mixed Noodle with Shredded Chicken ($4.50) on their menu. It is served along with the free flow of soup. He asked, "You got to know about us from our Facebook page?" I nodded. He said, "We are going to have new items on our menu and we will announce it on there." As I was the only customer at that time, I did not have to wait too long to receive my orders. Alfred said, "Whether you like it or not, do leave us a feedback." As a frequent traveler to Hong Kong, I have yet to try Salt Baked Chicken, also known as Yim Guk Gai in Cantonese, right there. It is a classic dish that is done using parchment paper to wrap up the chicken then bury in a pot of coarse salt and simmer. The modern way of cooking this is to boil or steam the chicken. This dish is not as common as I thought, I could not get much information on where to eat it in Hong Kong when googled. The Salt Baked Chicken did not taste like what we have here. It did not have much saltiness. My dining companion said, "It tasted more like a braised chicken and there is a slight sweetness." The noodles were tossed in the sauce then topped with some minced meat and a handful of ikan belis as well as sliced cucumber. Those slices of preserved cucumber were a bit too sourish with a strong taste of vinegar which I did not like. 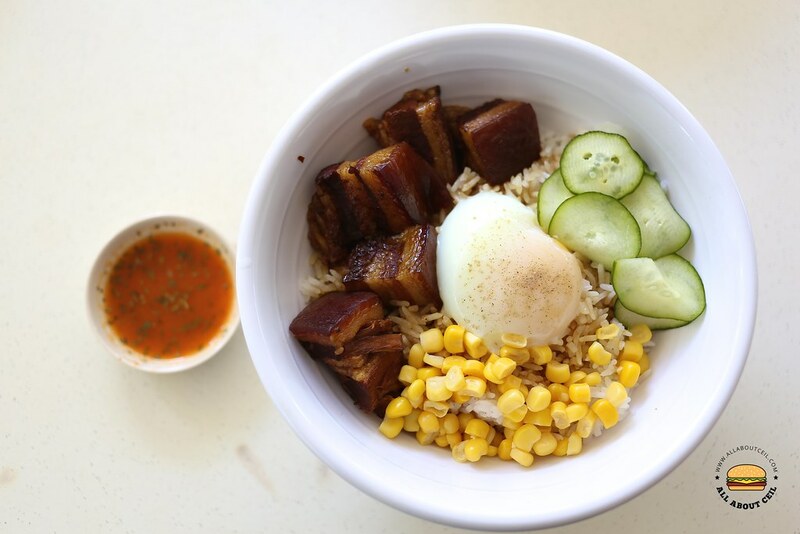 Classic Braised Pork Belly Rice was served with chunks of braised meat, sous vide egg together with steamed sweet corn and sliced cucumber on the rice. The rice was slightly drizzled with braised sauce. The braised pork belly is done using the slow-cooked method to absorb the full flavor. The texture was meltingly soft but was not as flavorful as expected. Also, tried the Penang char kway teow at jurong west? Not yet seen the video and also not yet try the Penang char kway teow at Jurong West. Will go when less busy. I tried the Vietnamese pho, I've not eaten that dish for ten years so I can't remember how it suppose to taste like but this place's version was comforting. Go quickly before they become famous. Thanks. I will go by quick, probably next week or so.